GenWeekly welcomes two new writers . . .
We would like to welcome two new writers to our GenWeekly staff: Cindy Drage and Rita Marshall. We look forward to their contributions. Appearing this week, in our last issue for the month of June, Cindy Drage, in her first GenWeekly article, "Don't Overlook Historical Societies,"examines the valuable support historical society volunteers can provide, especially in locating those unique sources that may not be available online, or anywhere else for that matter. Rita Marshall's first article exploring DNA research will appear next week, in our first article for the month of July. Again, to our new writers, Welcome Aboard. In conjunction with the Southern California Genealogical Jamboree, I released some project management tools to help visitors keep track and organize the genealogical resources that they discover while using the search engine. Throughout Live Roots, registered members will now see Follow, Comment, Record and Share buttons. For more information, please read "Live Roots Search Experience, Release Two". Almost anyone who has done genealogy for awhile has either heard about or utilized one of the many Family History Centers to be found around the world. In her article, "The Wonders of the Family History Center," Judy Rosella Edwards explores the role of the local Family History Center today, when so much information is available online so easily accessed in the comfort of one's own home. Considering the vast archive from which the Family History Center draws and the many services it provides, it is not likely to become outdated anytime soon. In the mood for a summer read? In her article, "Genealogical Summer Reading 2009," Gena Philibert-Ortega brings into focus a variety of genealogy-related works covering a range of topics from the murder mystery to an exploration of the LDS penchant for genealogy. Surely, something for everyone. For those just beginning to explore their ancestral roots in another county, Alan Smith's recent article, "Exploring German Ancestries," takes a look at some of the first steps. The more general principles discussed would apply to research in any foreign country, beginning with an exploration of the political, geographical, and cultural history. Determining who was in power at any given time and how areas were divided and records maintained is the key to successful research abroad and at home. How many Genealogical words is a Picture worth? With more genealogists posting photos online, it only makes sense to include sites like Flickr and Picasa Web Albums to the Live Roots project. In addition to photos of ancestors, you may stumble upon cemetery images of tombstones, or historical buildings where your ancestors lived, worked, worshiped or played. Both of these new search interfaces can be found on the real-time search page. Also, thanks go to Wevonneda Minis, who I met at the NGS conference in Raleigh, for her nice article on Live Roots, "Search engine for genealogists." Last week, I picked up a document at auction that listed the pew holders for a church in Morristown, which is very close to where I live. The name sounded familiar, as we spent New Year's Eve at Morristown's First Night recently. The document was "List of the Pew Holders and Sitters in the Church of the Assumption, Morristown, N. J., January 1st, 1898," and after uploading the transcribed information this morning, I decided to take a drive and photograph the church. There's a historical marker outside the church that reads, "Gothic revival building is the oldest standing church in Morristown. Replaced 1848 wooden church which ministered to Irish immigrant families in surrounding Dublin area." From the church's website: "In 1847, a lot of land was purchased by Father Louis Senez, (pastor of St. Vincent Parish in Madison) for $400 to build the first Catholic Church in Morristown. 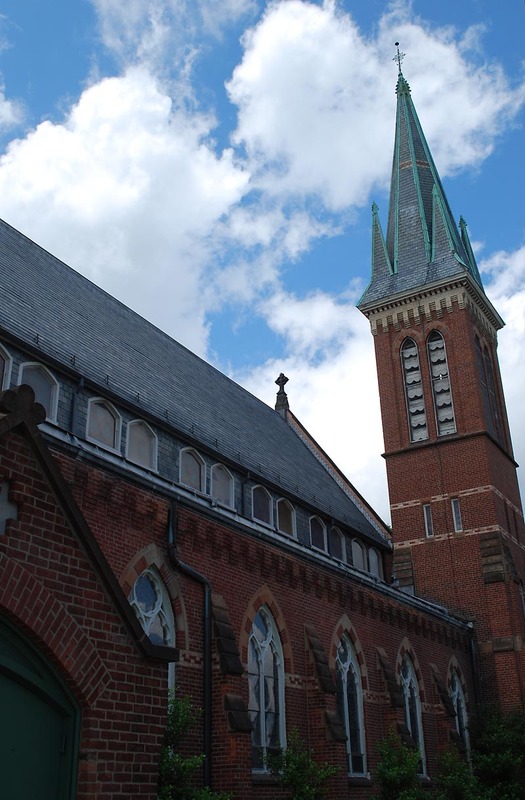 The building of the church was then left to Father Bernard McQuaid. The original wooden church structure stood on the site of the present-day rectory. By August 15,1948, the modest church was roofed and Father McQuaid gave the church the title of the Assumption of the Blessed Virgin Mary. Mass was said for the first time in the church on Christmas Day, 1948. The new church was dedicated on March 5, 1849." 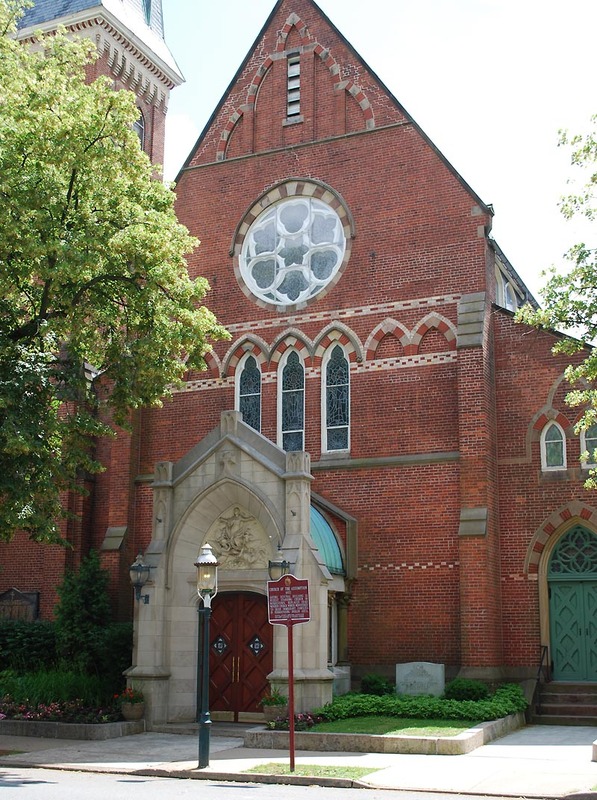 The church is located at 91 Maple Ave, Morristown, NJ 07960. On the cover of the document that I acquired it states, "Every resident of this Parish is in duty bound to contribute his and her share to the support of the Church and the Church Work. The principal source of revenue is the renting of pews and sittings. Nobody may reasonably expect to participate in the benefits of the Parish, unless identified with it by the renting of a pew or sitting." It was such a nice pleasure to be able to visit a place mentioned in one of the documents included in my Family Tree Connection project. All of the photos were uploaded to a folder on Flickr. The misspelling and misinterpretation of surnames is a classic problem for genealogists, one that never ceases. No matter how seasoned the researcher, surnames continue to challenge. In her article, "Will the Real Mr. Snider Please Stand Up: Finding Your Ancestor's Misspelled Name," Gena Philibert-Ortega continues her discussion of the surname challenge, suggesting ways to circumvent an all too common problem. Although the popularity of genealogy has grown exponentially in the past decade, it has been an important in the lives of many cultures since ancient times. In her article, "The Role of Genealogy in History," Melissa Slate touches on several such practices. While surname searches are important to genealogy, they are not the sole solution. In her article, "Getting Past Your Ancestor's Surname: The Need for a Comprehensive Research Plan," Gena Philibert-Ortega suggests a research strategy and offers multiple sources for moving beyond the surname. In may be that the one source you need is not indexed by surname, but by some other organizational category. As noted in the article, a well thought out plan will help a good researcher cover all the bases. Regardless of their time or culture, our pioneer ancestors are near and dear to the heart of a family history researcher. But have you ever considered the origin of the word "pioneer"? Who would imagine it originated in war time? In her article, "Lexicons of Lost Lifestyles: Words of War, Part 2 ," Jean Hibbens explores some of the earliest wars in recorded history and how that language is used today. In particular, she explores how many of the meanings have been altered, in at least one case, reflecting pretty much the exact opposite of its original intent. I've added an "Advanced" link to the small green search box that appears on every page of the LiveRoots.com website. This will lead you to the search tool that I developed for the iGoogle gadget, allowing you to search any of the resources accessible through Live Roots. Also, if you are a FamilyTreeMaker user, check out this blog post by Russ Worthington about adding LiveRoots.com as a custom search option. UPDATE: The iGoogle gadget that I created is now also available in the orkut online community application directory (search for "Live Roots").